Suggested by Sonic Noboru Kodo is back, but he’s going to have a tough time against Drum. Drum got a pretty cool Super Saiyan super form at the end of the first Buddyfight season and then he also unlocked his true abilities in the sequel show. 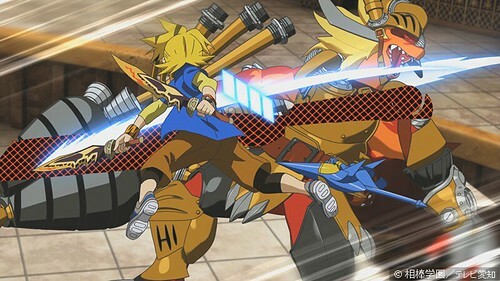 While he may just be one monster against Noboru’s entire army, I have to admit that I like his odds. It’ll be difficult for Kodo to damage him and Drum will definitely have the speed advantage. He simply overpowers the difference in numbers. Drum Bunker Dragon wins. This entry was posted in Battles, Drum Bunker Dragon Battles, Noboru Kodo Battles and tagged Drum Bunker Dragon, Noboru Kodo by dreager1. Bookmark the permalink.